Oxygen is the element with atomic number 8 and represented by the symbol O. Its name derives from the Greek roots ὀξύς (oxys) ("acid", literally "sharp", referring to the sour taste of acids) and -γενής (-genēs) ("producer", literally "begetter"), because at the time of naming, it was mistakenly thought that all acids required oxygen in their composition. At standard temperature and pressure, two atoms of the element bind to form dioxygen, a very pale blue, odorless, tasteless diatomic gas with the formula O2. How important is Oxygen in flying? Generalized hypoxia (Oxygen-deficiency) occurs in healthy people when they ascend to high altitude, where it causes altitude sickness leading to potentially fatal complications: high altitude pulmonary edema (HAPE) and high altitude cerebral edema (HACE). The symptoms of generalized hypoxia depend on its severity and acceleration of onset. In the case of altitude sickness, where hypoxia develops gradually, the symptoms include headaches, fatigue, shortness of breath, a feeling of euphoria and nausea. In severe hypoxia, or hypoxia of very rapid onset, changes in levels of consciousness, seizures, coma and death occur. Increased oxygenation enables to stimulate the body’s chemical reactions, and therefore the concentration of the crew and the passengers. The following diagram shows the altitude recommendation of supplemental oxygen use. Oxygen is produced industrially by fractional distillation of liquefied air, electrolysis of water and use of zeolites with pressure-cycling to concentrate oxygen from air. 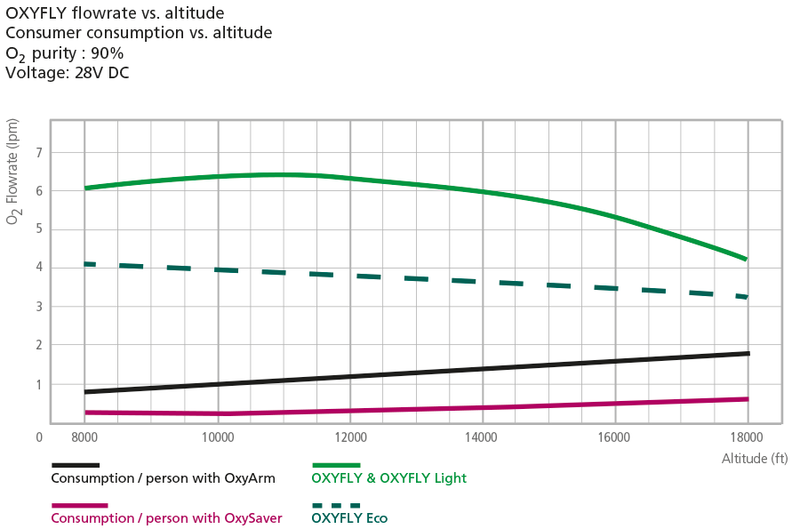 OXYFLY is based on this last mentioned technique: it involves passing a stream of clean, dry air, insured through our high quality oil-free compressor, through one bed of a pair of identical zeolite molecular sieves, which absorbs the nitrogen and delivers a gas stream that is 90% to 95% O2. Simultaneously, nitrogen gas is released from the other nitrogen-saturated zeolite bed, by reducing the chamber operating pressure and diverting part of the oxygen gas from the producer bed through it, in the reverse direction of flow. After a set cycle time the operation of the two beds is interchanged, thereby allowing for a continuous supply of gaseous oxygen to be pumped through a pipeline. An adult human in rest inhales in average 7-8 liters of air per minute. The inhaled air is about 20% oxygen. Therefore, a human being uses about 1,5 liters of oxygen per minute. As the oxygen quantity in the air decreases with increasing altitude, crew and passengers need additional oxygen in unpressurized aircraft. The following diagrams shows the need flow rate for an adult, depending on the flight altitude, using nose cannula or OxySaver. What are the hazards of highly concentrated oxygen? Highly concentrated sources of oxygen promote rapid combustion. Fire and explosion hazards exist when concentrated oxidants and fuels are brought into close proximity. Concentrated O2 will allow combustion to proceed rapidly and energetically. The fire that killed the Apollo 1 crew in a launch pad test spread so rapidly because the capsule was pressurized with pure O2 but at slightly more than atmospheric pressure, instead of the 1⁄3 normal pressure that would be used in a mission. OXYFLY system however does not storage oxygen. The generated oxygen is directly consumed. 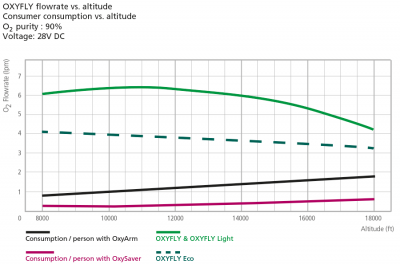 Can I use OXYFLY on my 14V-airplane? Yes! Therefor you need a supplemental alternator, for example GAMI's Supplenator .